Occasionally I like to look back on the Beyondthewhiteboard calendar and find a particular week or day and replicate it to see how I compare to those results. 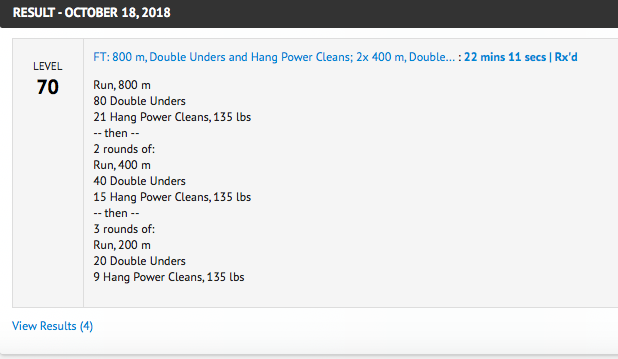 Today, I found an interesting workout that fit with our week. It was November 25, 2015. I replicated that day exactly today. I am constantly trying to improve but as I age, I am also happy to not be losing fitness. In 2 of these workouts I was 1 or 2 reps off my previous best 3 years ago. I surpassed this by 6 reps today. We had a good group and I was lucky enough to get a spot next to Justin. He killed it. He is so fast and strong on these movements. I finished 24:22 and he was right at 20 minutes. This trip has been slightly challenging to maintain my everyday Fitness. It has also been challenging to maintain my mental focus on positivity. whether it is getting up 2 hours earlier or hitting it before dinner, it is incredibly important for me to stay on the path to maintain both mental and physical standards. Loooooooooong dayz filming the Saltwater Experience show on this trip. The weather is really nice and we are getting some great stuff. Days start with Wim Hof Breathing of at least 5 rounds and then push-ups. I have followed that up with a body weight workout or a yoga session to get everything moving. back at the garage Birthday wishes go to Reggie. I’m sure that Alan has something planned for you. on this trip I brought a 53 lb kb, a 45 lb sandbag, jump rope and some bands. I’ll get a little more creative in the days to come. i also listened to a great podcast. James Altucher has a fantastic podcast and his interview with Henry Winkler is my favorite yet. Henry Winkler was The Fonz. Possibly the most iconic character ever on TV. He was incredibly popular and smooth. Yet, he is severely dislecsic. He has overcome this major issue his whole life. This was a great format. I really liked it and I think I could create many others like it with this format and different exercises. So one round, followed by 2 rounds followed by 3 rounds. Even thought the distance and reps shrink, the 2nd round was toughest as we did the most HPC. I felt like I did pretty well on it. Kyle was right behind me at Rx. Today was a day designed to ease into the weekend. It has been a tough week of training and I was sore and somewhat tired. I wanted to move today and clear some of the soreness but not go too crazy. I went back to a partner workout from a few years ago. 2 man team. Only one person works at a time. For 2 minutes, complete as many reps as possible. Use strategy to see how your team can be the most efficient. 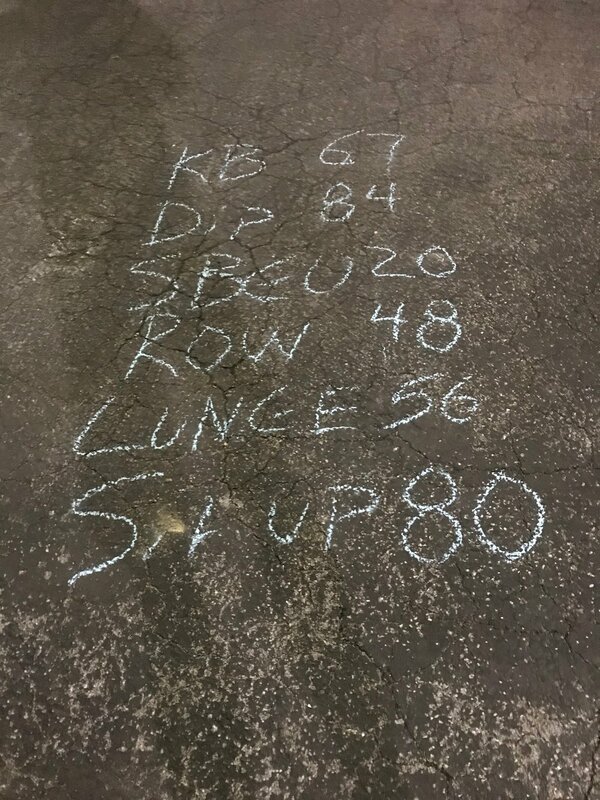 For Alan and me, we switched at 10 swings, 5 dips, 10 sbgu, 10 row, 10 lunge and 10 situp. Once you have worked for 2 minutes on the first exercise, then write your score down and rest 1 minute before starting next one. With a rare rain storm this morning at our training time, I decided to stay dry and get on the Assault Bike. Once the workout started, we all wished we were running in the rain. I was getting between 20-25 calories each time with a high of 31 for the first one. Alan and Michael maintained 450 watts each time which had them around 30 calories for each round. ok, that makes WAY more sense. A 20 lb vest + Murph and Coe before doing this workout would easily cut 3 + rounds off. Maybe I should have done better today! Its been a little busy at work, but I am really trying to write here every day. I am doing so much writing and producing new content on my business pages, that it has been hard to even get the workout down on this page. Sorry about that. Check out www.saltwaterexperience.com or www.tomrowlandpodcast.com to see all the new shows, articles, and podcasts that are going up each week. As for the workout, nothing has slowed down. As work gets crazy or stressful, my peace is found in long runs, long walks, and close to death workouts. Funny how it makes me feel so much better…immediately. We did community service work this morning in lieu of the workout. However, it was a workout. Then, Shoulder openers, banded couch stretch, calves and Frog.